I posted two pictures in today’s WW. They were both taken in the parking lot at work last Thursday. My work is in suburban NJ, fairly close to a large heavily wooded park. There is a lot of wildlife running around. Often in the morning and the last two hours or so before sunset the deer come out. The first picture was taken at my car, standing just inside the door (I was trying to psych out the deer- if they think you are walking toward them instead of a car they head up the hill and into the woods). I moved a little bit closer for the second picture and was able to get a good shot of one of the deer using the camera’s zoom. I cropped it down some for this post. My favorite picture didn’t make the WW post- I put it in the extended entry, so click if you want to see it. Once again, this was cropped from a larger picture (and ended up a little bit blurry as I couldn’t get very close). Clearly not everyone likes having their picture taken. Deer are fascinating animals – You’ve taken some great shots of them! Happy WW! Thanks for stopping by Katarina. I loved your WW post and the other pictures I saw at your blog. Your Swedish wildflower are garden shots are amazing. 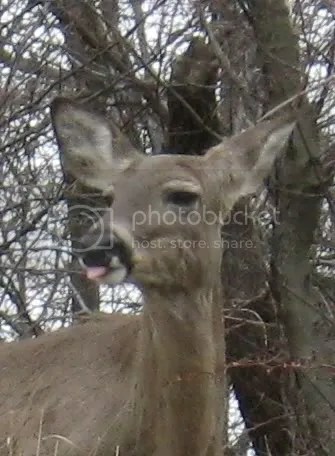 I do believe s/he is sticking her/his tongue out at you! My thoughts exactly Gypsy at Heart!